There is a whole branch of astrology known as AstroCartography, in which your natal Birth Chart is projected onto the map of the earth. From this, one can deduce where in the world it would be best to live to get the best out of different energies in our natal charts – or where it might be best to avoid. eg John F Kennedy‘s Pluto line ran right through Dallas, Texas. Also, it is indeed possible to cast a new chart for the latitudes and longitudes of your current place of residence and compare it with your natal chart to see what the different emphases are as a result of those changes. To use a very simple example, someone might marry and settle down in a different location, then find that the planet Venus was much more prominently emphasised in their horoscope there than in the natal horoscope for the birth location. It’s a very interesting topic – not one with which I have worked either personally or with my clients. I wouldn’t want to find out that my five twelfth house planets would be conjunct my Midheaven, bringing me fame and fortune – but only if I relocated to Ulan Batar! 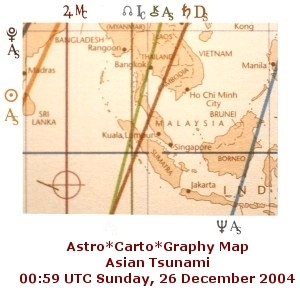 This entry was posted in An Astrological Miscellany: of cusps, virgins, atomic scientists, Muhammad Ali and much, much more...(13 articles) and tagged AstroCartography, Dallas, horoscope, John F Kennedy, Midheaven, Natal chart, Pluto, Venus. Bookmark the permalink. Oh, you poor sweetie. I am so sorry you are having tendonitis. (I get it in my shoulder and I am a golfer…can’t seem to make it go away.) If I’d known, I’d never have asked a question. Thank you a million times over for answering my question, I truly appreciate it. I will look at the links. You take care of that hand. And I will send healing thoughts through the Universe to you. many thanks for your kindness and good wishes which I really appreciate. My hand is slowly on the mend – just needs rest. And sorry you get this affliction too. One of the many dubious delights of growing older and the body objecting to what it used to take in its stride! And thanks for asking such an interesting question. I’m sure it’s led some readers into new territory…. Anne, I was wondering where you were! I’m so sorry about your tendonitis. No need to respond! Rest your hand, and I hope you are soon healed and back to blogging! many thanks for the kind message. I am now the quantum blogger – now you see me, now you don’t, flashing in and out of the blogosphere in an unpredictable fashion! But the hand is improving, slowly…. Oh, my. When you’re on the mend – or even better, healed – here’s a question for you to ponder. Does the old business of things coming in “threes” get addressed by your discipline? The past two weeks I have (1) done a face plant on the swim platform of a boat, and very nearly broken my nose. I didn’t, but it’s been a long two weeks of healing. While I was healing, (2) my nice new car was backed into by a neighbor, and smooshed on the driver’s side. While I was waiting to hear back from the insurance company about that, I was carrying my phone around with me. That led to (3) my leaving it on the deck of the boat I was working on. It got rained on, and quit working, necessitating a new phone and rebuilding my contact list. See? Threesies! I hope I’m done with it now. I’m really so sorry about that tendonitis. I’ve had it in my shoulder from work, and rest is the very best thing. I do hope you’re feeling better – and take your time. Whenever you feel like another post, we’ll be here, but you need to take care of you first. many thanks for your kind thoughts, most appreciated. We are indeed a community of tendonites, it would appear! Yes, rest is the cure for many things in life, and tomorrow as part of my rest we are off to the beautiful, sacred Isle of Iona off Scotland’s west coast for a couple of contemplative days. I like your question, although you must have felt quite unnerved by the events which have caused you to raise it. Yes, I think I can say a few relevant things about your threesies experience. I suspect the action of the planet Mars amongst other things since the end of July up to mid-August was a turbulent, disruptive time to a greater extent than usual in the wider world, and individual lives ‘plugged into’ this energy field have been feeling it too. Do take good care of yourself! And you’re welcome to the sunset – just wanted to be sure you realize it’s not an El Greco, but one of my photos! Have a wonderful few days of travel and relaxation. It sounds wonderful! Thanks for putting me right on that! Many thanks for your good wishes.My arm and wrist are much better now. The trip to Iona was wonderfully restorative. On the night of the full moon, I went out for a twilight stroll by the sea which was misted over by an evening haar, creating a hazy filter through which the full moon glowed. I took some very atmospheric photos – which I may well put up on Twitter.